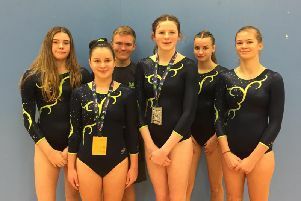 The opening day saw the Club Grades competition and had three gymnasts representing the region. Jamie Ward at Club Level 1 and Eric Breslin and Cameron Barnes at Club Level 3. It was Jamie’s first National Finals and he performed very well. He had a personal best score of 59.050 and finished in 28th Place out of 60 gymnasts. In particular, his pommel and vault scored high with 9.40 and 9.5 respectively. Over the last few months, Jamie has made amazing progress and we look forward to seeing what the next year brings. Cameron and Eric were both competing in Club Level 3. Eric smashed his competition and finished an amazing sixth overall. This placement secures Eric a spot at the National reward camp where he will train at Lilleshall – a club first to have a MAG gymnast qualify for such a reward. His overall score was 60.975. 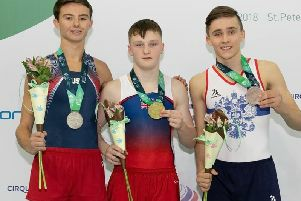 A great achievement for both gymnast and coach Liam O’Brien. Cameron performed well, but unfortunately had a fall on his first piece, pommel. He pulled it back though to compete well on other pieces and achieved an overall score of 55.000. Two days later, the Elite grades took to the competition and the standard was extremely high. MK Gymnastics had two gymnasts represent the region at Elite Level 2 - Ethan Clarke and William Jefcoate-Scholes. Ethan showed his normal competition composure and competed seven clean routines. His vault needs a particular mention as he scored an amazing 9.90. His overall score was 56.800 which secured him 22nd spot. Wills had a good competition apart from some very silly counting mistakes where he did an extra giant on high bar and an extra swing on rings. In the world of grades and set routines, this carries heavy deductions. As a result, his score was only 52.900 which gave him a placement of 37. For both Elite boys these placements mean they are 22nd and 37th in GB.